These two examples have been going around my facebook feed lately and I just feel the need to share them to you too! First up Stop female death in advertising. It’s a visual protest list from design graduate Lisa Hågby, that is made so everybody can contribute. 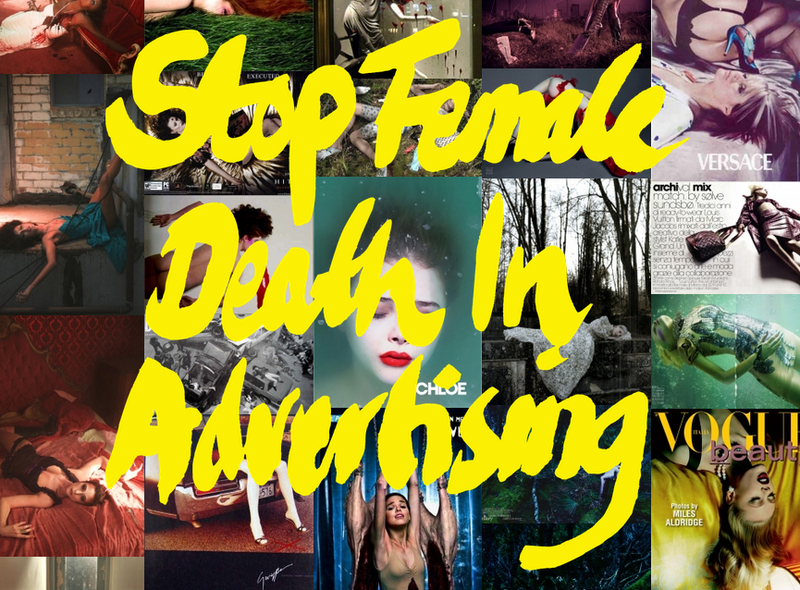 “Stop Female Death In Advertising aims to illustrate and protest against the passivation of the female role in commercial contexts, something which we often see but which rarely draws a reaction. For this very reason I have chosen to focus on the most extreme form of passivation: images which utilise the motif of a dead woman. When you see all the ads next to each other it make my head spinn. Head over to the site and see even more and read more about it. The other thing – that I also think is a must- read for all people and a great reminder of the world we live in is the 33 reasons to be a feminist. Go there and read it! Come on world – we can do and be better than this. Thank you for sharing this! The feminist movement has stagnated because of bad press and the feeling that we are “done.” These reminders are so important. You said it, sister. I never realized how prevalent this ‘dead woman’ motif in advertising was…..how often do you see images of drowning, Ophelia-like men? TACK och nu jävlar skapar vi lite nytt och inser att det behöver inte vara såhär ! Ut och bränn bhar och kallingar ! Love this post! So important. Bravo! It’s time to began to said no more!!!! Have nice week-end from Québec!